Glass Pineapple Table Lamp. Northern Ireland BT, Isle of Man IM, Isles of Scilly TR21-25, Isle of Wight PO30-41. 60 watt SES candle or LED bulb (Required). Black shade with gold lining. Gold cable inline switch. Antique Brass Uplighter Floor Lamp. Condition is Used. Although sold as Used. they are in exception condition. Sold as a pair at a buy it now price £15.00. Will not separate. Northern Ireland, Isle of Man, Isles of Scilly, BT, IM, TR21-25, Isle of Wight PO30-41. Bull dog table lamp complete with ruffle shade. Base width 22, Shade width 26. Height excluding shade 29. 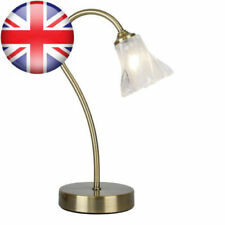 THIS LAMP IS FITTED WITH 3 PIN BRITISH STANDARD PLUG . upcycled floor lampstand and shade. Condition is Seller refurbished. Height 161cm. Foot switch operated. Boxed for collection. Assembly instructions included. Shade: included. Finish: antique brass. Overall height is 85 cm and the square bases are 15 cm by 15 cm. Quite heavy. San Remo Spiral Floor Lamp. All looks perfect and all parts included. All glass shades intact. Self assembly Is required. Depth: 540 MM. The camshaft has been removed from a DOHC 16v engine and uses the cam pulley as a base, keeping the weight down low to stop the lamp from being easily knocked over. Camshaft and pulley are a used car part, taken from various cars and mileages. Pair of original, vintage meat grinders turned into lamps, perfect for an industrial/steampunk setting. Great as bedside lamps. Requires bayonet bulbs. Works with all types, including smart bulbs. Items are heavy iron. The handles still move, so still retain their originality! A bit different from your usual bedside lamp and have always been conversation pieces. Pair are not identical, but extremely similar- these are original grinders, so very difficult to find an identical pair! First four photos show one, second four the other. Please check them out and get back to me if you have any questions. Please check out my other industrial/steampunk style items. Thanks for looking and happy bidding! Zella Antique Brass floor lamp. RRP £85 as can be seen on invoice shown in pictures. Bargain because of glass of main mirror and small lamp glass shade. Beautiful floor lamp for sale by John Lewis. Antique brass. Constructed from steel. WEIGHT: 1.418 kgs - Per Light. Lampholder Socket : G9. Colour : Antique Brass. Energy Class of Lamp : A to D. Lamp Included : No. Cookware, Dining & Bar. Location of Switch : Yes - Toggle Switch. ceiling lights & chandliers. Add to Favourites. This Traditional 3 Light Floor Lamp from the 'Nelson' range by Diyas Lighting looks great and is ideal wherever an old fashioned look is desired. The IL-IL20664 has a Antique Brass finish. The 'Nelson' range consists of matching 8 Light Pendant Fitting, Double Table Lamp and 4 Light Semi Flush. a pair off bespoke quirky candelabra lamps, sprung steel dark brown columns. price includes 2 off very attractive lamps on american mahogany hard wood bases. these lamps where originally candle holders and have been converted to lamps. They are wired with a 3 core cable and have a proper earth connection to the metal work. Lampholder Socket : G9. Colour : Antique Brass. Energy Class of Lamp : A to D. Lamp Included : No. Location of Switch : Yes - Toggle Switch. Add to Favourites. Length (cm) : 30. Protection Class : Class 1 - Earth Connection Required. ANTIQUE BRASS FINISH HALOGEN TOUCH TABLE LAMP. 2 x G9 40w included. Complete with Crystal shade as pictured. Alaska Floor Light. Create a warm and inviting ambiance in your living room with the traditional Elisa floor light. Finished in antique brass, it has 3 frosted glass shades perfect for creating a soft and atmospheric glow. Crafted with three quaint dancing elephants, this antique brass table lamp features a natural shade. Antique Brass. One Table Lamp. Wipe clean with a soft cloth. Base Material. B22 Bayonet (BC). 1 x 60W B22 (Bayonet) GLS bulb. Bulb Type: E27. A classic Antique table lamp designed to take 40cm to 50cm tiffany stained glass shades.The model is the well known Lily pad base. The model is the well known Lily pad base, use a stained glass shade of your choice. Charcoal Clerkenwell Table or Desk Lamp. The charcoal Clerkenwell light is crafted in powder coated steel and has an adjustable shade and arm. Bulb Type: E27. A classic Antique table lamp with a Modern design finished in an Dark Brown colour which can take 40cm to 50cm tiffany stained glass shades. The model is the well known Lily pad base, use a stained glass shade of your choice. Traditional Antique Brass Floor Lamp. Adjustable rise and fall choice. Complete with White pleated shade. Searchlight 9961AB Thia simple, stylish touch table lamp has a fully adjustable cylindrical opal glass shade that can be moved forwards or away from the elegant antique brass finish stand. Paper Lantern Shades. 3573AB BELLIS II. 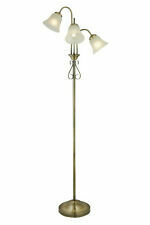 3 light floor lamp with antique brass base and stem and glass flower detail. Features decorative globe shades. Floor lamp. Antique brass finish. 3 x 33 Watt G9 halogen lamp(not included). New listingcarboy table lamp brown glass pat tested. carboy table lamp brown glass pat tested.. Condition is Seller refurbished. Dispatched with Royal Mail 2nd Class. Touch table lamp in antique brass with white glass. Antique brass finish. Touch Lamp. Table lamp. White glass. Height: 380mm. A classic Antique table lamp designed to take 30cm and 35cm Tiffany stained glass shades.The model is the well known Lily pad base. Shade carrier / harp supplied, use a stained glass shade of your choice. Searchlight 4571AB This Bellis II antique brass table lamp with clear glass shade and leaf decoration looks beautiful on any bedroom, living room or dining room table. To view the full range just type 'Bellis' into the search box. WOOD COLUMN LIGHT WIRED WITH SWITCHED LAMP HOLDER. A task table lamp with an antique brass effect plate finish and an opal glass shade. Matching floor lamp and other colour options available. Antique brass & white glass. Constructed from steel & glass. STURDY DESIGN IPARRI BY ENDON. INCLUDES NATURAL LINEN LINED HEXAGON SHADE BY ENDON. ANTIQUE CREAM TURNED CARVED WOOD TABLE LAMP. (WHITE LAMP HOLDER & CABLE INLINE SWITCH). IDEAL FOR LIVING ROOM.BEDROOM, DINING ROOM, HALL. 23 Claret carboy table lamp. Condition is Seller refurbished. Dispatched with Royal Mail 2nd Class. carboy table lamp brown glass pat tested.